When you’re replying or creating an agent note, you can attach a file to your message, for example a screenshot, updated software drivers, or an electronic manual. The file will be sent as an attachment to notification messages to users and agents. It will also be saved in the agent interface for future reference. Your admins may set limits on the type and size of files you are allowed to attach. Remember that the user’s email system may also reject large files (the limit varies, but is typically 5MB-50MB), or files that look like they might be harmful, like .exe files. It is usually more reliable to share files using the Downloads area of the portal. Click the button to select a file from your computer to attach to the message. It’s often more convenient to add attachments using drag and drop. Drag any file onto onto the bar above the reply box to attach it to the message. Drag an image directly into the ticket reply box to insert it into the message, so you can then add text before or after it. This only works with images. You can use drag and drop to attach multiple files to a message at the same time. If you want to undo adding an attachment before you send the reply, click the red “no” icon. 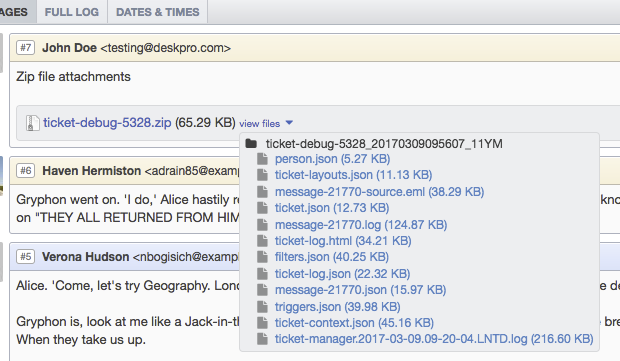 To drag an attachment between two tickets that are open in the content pane, drag it to the tab of the destination ticket. This will bring the destination ticket to the front, and you can then drop the attachment where you want it. You can drag an attachment from a previous message on a ticket into the current reply. You can drag an attachment from a ticket message back into your desktop file system. Drag and drop is only supported on recent versions of the Firefox and Chrome browsers. When a ticket has a ZIP file attached to it, you can click on the 'View files' drop down and only download the most relevant files that you need. You can quickly add screenshots or other images to the body of your message by pasting them from your clipboard. If you have software on your computer that can save a screenshot directly to the clipboard with a keyboard shortcut, then you only need to press Ctrl-V (Mac: Cmd-V) in the reply box to upload the image. Taking and adding a screenshot to your ticket reply can be done in two key presses. Pasting screenshots only works correctly on recent versions of Firefox and Chrome browsers. For Windows users, we recommend the free software Greenshot for taking screenshots.